Flower Carpet | Flower Carpet: an ephemeral show on the world’s most beautiful central square! The Flower Carpet is 75 m long by 24 m wide. 1,800 m2 of begonias, dahlias, grass and bark. A hundred volunteers assemble the carpet in less than eight hours. The first Flower Carpet of Brussels was created in 1971 and has been a showstopper every two years on the Grand-Place since 1986. Every other summer, on the weekend of August 15th, the Flower Carpet offers a chance to stroll across the Grand-Place, a jewel of Gothic architecture, to inhale the fragrant scent of the begonias and admire its details. This extraordinary spectacle is made complete by a visit to the balcony of the Town Hall, which offers a wide-angle view of the work. A musical theme is especially composed for each edition. A concert is given on the Grand-Place every evening and accompanies a magnificent sound-and-light show. The robust tuberous begonia lends beauty and freshness to the carpet. A native of the West Indies, the hearty begonia is resistant to all weather conditions: intense sunshine, violent winds, rain, cold . . . Begonias come in a rich palette ranging from the most vivid colours to delicate pastel shades, with in between the many-coloured and white flowers that reflect sunlight so well. Belgium is the world’s largest producer of begonias: 35 million bulbs each year! 80% of the total production, cultivated almost exclusively in the area of Ghent since 1860, is exported, primarily to the Netherlands, the United States, the United Kingdom, France and Germany. More than 100 volunteer gardeners put together this giant floral puzzle in less than eight hours. The day before the opening, the spaces between the floral motifs are filled in using rolls of sod. The flowers are so closely-packed that they can´t be blown away, and indeed they create their own microclimate! If there´s a heat wave, the sod is watered to prevent it from wilting. If the weather is too wet, the grass can grow by 4 to 5 centimetres in 3 days. The flowers remain fresh and preserve their splendour during the four days. This was the work of the landscape architect Etienne Stautemas, born in Zottegem in 1927. A graduate of the Horticultural College of Ghent, he began to create flower carpets in the early 1950´s. Simpler, smaller, these “rugs” were primarily composed of begonias which he loved and with which he worked ever since. After years of testing and calculations, the team of Etienne Stautemas, together with designer Mark Schautteet, imposed itself as the specialist in the creation of immense flower carpets, with sophisticated colours and complicated designs. The team went on to create more than 180 carpets, in Ghent, Bruges, Cologne, Luxembourg, Paris, London, Amsterdam, The Hague, Vienna, Valencia and even Buenos Aires and Columbus (Ohio). But “nowhere else is the carpet as magnificent and distinguished as on the ancient and unique Grand-Place of Brussels”. This is the historical heart of Brussels. Here Gothic style can be seen adjacent to opulent baroque, neo-classical as well as neo-Gothic. The Grand-Place is regarded by its admirers as “the most beautiful central square in the world”! Its construction began in the 15th century, with halls, guild houses and a Town Hall. It was virtually razed after 3 full days of bombardment by the French Army in 1695, yet was rebuilt in less than 5 years, notably by the different guilds. The tower of the Town Hall is 96 metres high. Every two years, the Flower Carpet offers a chance to (re)discover this architectural and cultural heritage jewel. Since 2000 the entire Grand-Place has been listed as a Unesco world heritage site. 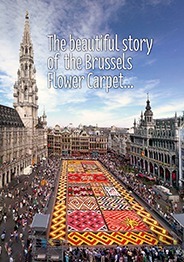 The Flower Carpet takes place in the center of Brussels at the Grand-Place. This place is very easy to access by public transportation, by bike or by car. With the SNCB Ticket B-Weekend your return trip is at half price in the weekend. Plan your trip for the Flower Carpet with the STIB. There are multiple Villo! stations near the Grand Place. There is a public parking available near the Grand Place. Interparking - Parking Grand Place, Rue Marché aux Herbes 104, 1000 Brussels.